I just have to add my starry-eyed thanks for FSM releasing BELLE OF NEW YORK. And, add my vote for THE BARKLEYS OF BROADWAY as a follow-up. It'd be worth the price of admission if only for Conrad Salinger's genius arrangement of the Gershwins' "They Can't Take That Away From Me" combined with George's Concerto in F."
I have the old MGM Records album and its rendition of the opening cue "When I'm Out with the Belle of New York" is somewhat different. It uses a vigorous percussive accompaniment and a second chorus stanza is repeated. This is not found in the film or on this recording. Was this a special cue just made up for the record album? I think if you listen again you'll notice the repeat chorus you hear on the original LP was just that, an exact copy of the first chorus played again. They used to do that with shorter songs sometimes on these releases just to make it time out to the track length they wanted. I think everything that was on the LP is here, in better sound, although edited and mixed slightly differently. Did Judy do any pre-recordings for "Barkleys" before Ginger replaced her? There's a story about Judy showing up on set in a costume for the film which had already been fitted for her before her replacement. judy did NOT do any recording for Barkleys.
. . . How about "Royal Wedding"? NO. I am sure if she did they would have been available by now. The BELLE OF NEW YORK cover is lovely and absolutely right for it. It was a good choice and a practacle one, because in case any one is interested, or that it matters (which it really doesn't), this was the artwork that was used on the Laser Disc "double feature" along with "I Love Melvin." Thanks again guys for all the intellectual minutia concerning these releases. I enjoy it thoroughly!
. . . this was the artwork that was used on the Laser Disc "double feature" along with "I Love Melvin." Film Score Monthly has established a top-notch reputation for restoration, but the label can carve a notch on its belt for resuscitation, too. With the release of the Original Soundtrack Recording of The Belle of New York, FSM has resuscitated the line of expanded MGM musical soundtracks, once the province of Turner Classic Movies Music and Rhino, later Rhino Handmade. Under the aegis of George Feltenstein, the Rhino/Turner affiliation produced definitive editions of classic musical soundtracks ranging from An American in Paris to The Wizard Of Oz, plus scores like Ben-Hur and North By Northwest and even rock soundtracks like Zabriskie Point. But the regular retail program stalled, with Rhino’s Handmade division bringing titles like Mame and Finian’s Rainbow to online consumers. Then that, too, came to a conclusion. Although Turner’s film library (including the Golden Age of MGM) and Warner Music Group are no longer under the same corporate umbrella, Film Score Monthly has continued releasing score titles under the TCM Music banner, and the recent 1,200-copy limited edition release of The Belle of New York marks, in FSM’s own words, the label’s first “all-singing, all-dancing” musical with a greater emphasis on songs than score. Well, what a gift the label has given us with this release, and it isn’t even Christmas! 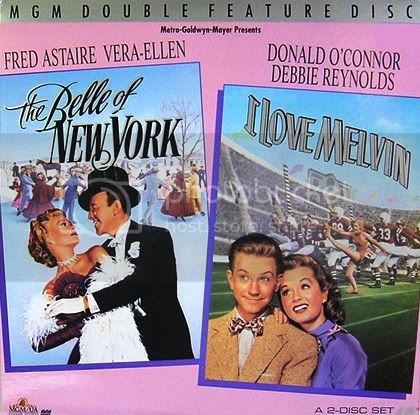 Although The Belle of New York isn’t in a class with the most renowned works of producer Arthur Freed’s Metro unit (including Meet Me In St. Louis and Easter Parade), and the film itself only sporadically comes to life, the soundtrack album is a complete delight from start to finish. Freed’s stamp is all over the picture; it’s no wonder that his name came after that of the director’s in the ads reproduced in the CD booklet. Belle began shooting on June 18, 1951, the very same day Freed began production on Singin’ in the Rain; what film wouldn’t have languished in the shadow of that masterwork? This is the sound of the vintage Hollywood musical as perfected by Freed and his musical cohorts, orchestrators like Conrad Salinger, Robert Franklyn and Alexander Courage, and arrangers like Roger Edens. For The Belle of New York, the team had an original score at its disposal, something even Singin’ – drawn from Freed’s own songbook penned with Nacio Herb Brown – couldn’t boast. It came from two bona fide legends of the musical, Harry Warren (“Lullaby of Broadway,” “I Only Have Eyes For You”) and Johnny Mercer (“One For My Baby,” “Jeepers Creepers”), who had already teamed for Freed’s The Harvey Girls. Adolph Deutsch conducted the orchestra and also composed and arranged some pieces. Like the Rhino titles that preceded it, Film Score Monthly’s new edition (FSM Vol. 14, No. 10) is a very model of the ideal soundtrack presentation, produced by Feltenstein with executive producers Lukas Kendall of FSM and Craig Spaulding of Screen Archives. Hit the jump to read on about these gentlemen’s mighty accomplishment! The Gay Nineties setting, so expertly conveyed in both song and dance music, is immediately transporting. Fred Astaire, already a legend by 1951, portrayed Charles Hill, a womanizing ne’er-do-well who vows to cast aside his wicked, wicked ways when he falls head over heels for Vera-Ellen’s Angela Bonfils, who just happens to be a Daughter of Right, working at a save-a-soul mission! (Shades of Guys and Dolls? Though Belle was first mooted for Astaire back in 1944, it may have taken that musical’s New York success for Freed to revive the concept. The original Belle pre-dated that Frank Loesser classic, however; it was an 1897 musical by Gustave Kerker and Hugh Morton!) Like many of the best MGM musicals, there’s a strong element of the fantastic in The Belle of New York. Astaire literally walks on air when romance wins him over in Deutsch’s appropriately-titled “Love is Walking On Air” which leads into the song and dance set piece “Seeing is Believing.” The song’s languid, romantic melody is accompanied by Conrad Salinger’s yearning string arrangement. In another moment, Astaire and Vera-Ellen literally enter a Currier and Ives painting for a jolly holiday of their own! Astaire is in top vocal form, though his winsome co-star Vera-Ellen (with whom he had danced in Three Little Words) was dubbed by Anita Ellis. In a supporting role as fellow Daughter of Right Elsie Wilkins is Alice Pearce, years before she became the first Mrs. Kravitz on television’s Bewitched. Pearce’s comic gifts are distinct on “Naughty But Nice.” Astaire’s anthemic “I Wanna Be a Dancin’ Man” was later adopted by Bob Fosse for his anthology musical Dancin’, and the showstopper is the score’s best bid for a standard. The charming “Oops,” also performed by the suave Astaire, received a popular cover from Louis Armstrong and Ella Fitzgerald. Most of the score was naturally written around Astaire, for whom Irving Berlin composed so many of his most famous songs. He imbues every one with that effortless charm: “The Bachelor Dinner Song” (“Who wants to kiss the bridegroom on his last night out?”) is delivered with a wink, and “Baby Doll,” heard in both a smooth solo and a nostalgic barbershop rendition, could have been an actual pop ballad. It features another easygoing Warren melody and spot-on Mercer lyric. It’s hard not to hear a touch of Singin’ in the Rain here, a dab of The Wizard of Oz there in the lush Metro “sound” and orchestrations. There’s a great deal of extended dance music on this disc, and it’s exciting even divorced from the visuals. (By all accounts, the film only truly takes flight during these sequences.) The big choruses and swelling strings may be the aural equivalent of Technicolor! And no studio was more Technicolor than Metro-Goldwyn-Mayer. The sound quality of FSM’s release sparkles. The lavishly illustrated, full-color 22-page booklet contains a historical essay by George Feltenstein as well as Frank K. DeWald’s “you are there” track-by-track liner notes. DeWald’s notes synopsize the story and also provide discographical information as to the origins of tracks, indicating which performances are from the unique MGM Records soundtrack recording, which ones are actually in the film, and which ones represent extended sequences that didn’t make director Charles Walters’ final cut. This program has been available as a digital download since 2004; the deluxe nature of this release proves why the physical package is so preferable. It hasn’t been announced whether any more musicals will receive the FSM treatment. But if you have even a passing interest in the Golden Age of Hollywood musicals, you owe it to yourself to pick up a copy of The Belle of New York. Not only is the old cliché “They don’t make ‘em like they used to” still applicable, but this Belle is lovelier than ever. You, too, will be walking on air! The info about Arthur Freed, however, considerably overestimates Freed's contributions and relegates Roger Edens' role in that unit as one of the "arrangers". Edens "associate"-produced most Freed musical productions, often wrote songs and underscore, chose the material that would be performed, selected the talent, etc. It was Edens who was the "essence" of the Freed Unit. It his taste, his style, his musical sensibilities that informed all the Freed Unit projects. Freed made it all possible, of course, as the "power" between the office of Louis B. Mayer (and, later, Dore Schary) and the actual productions, most of which were under Edens' control. It's not for nothing that someone once said: "Edens gave Freed 'class'"! Edens was the man responsible for creating Judy Garland out of Frances Gumm...who shaped her career path, who chose her songs, who developed her style...all after being bowled over by her incredible raw talents. It was Edens who, uncredited, shaped her comeback at Carnegie Hall in the 1950s. It was also Edens who, again uncredited, worked his magic on her material in "A Star is Born", including writing the "Born in a Trunk" number for her. (from wikipedia on the John Kennedy inauguration): There were some thoughts of omitting the inauguration ceremony due to heavy amounts of snow from the January 1961 nor'easter that fell the day before the inauguration and the temperatures which hovered at 10 degrees below freezing. Frank Sinatra organized and hosted the pre-inaugural party that night. Many Hollywood stars were involved, including Bette Davis, Fredric March, Laurence Olivier, Sidney Poitier, Nat King Cole, Ella Fitzgerald, Gene Kelly, Bill Dana, Milton Berle, and Ethel Merman, who were rehearsed by Kay Thompson and directed by Roger Edens. Roger Edens has never received the credit due him...so I yap away every chance I get! I'm looking forward to this release as well. My appreciation of film music coincided with my discovery of film musicals at the same time, all beginning in the 1970's. No doubt the release of "That's Entertainment" spurred this interest on. I'm glad to see Roger Edens mentioned, who, as alluded to earlier, played a major role in the MGM musical, but his contributions have been down played. In "Me and My Shadows" the excellent Garland tv-movie biopic starring Judy Davis, Edens, when talking with Garland, always refers to her by her given name, Frances. I was wondering if this was factual, or a dramatic device used by the filmmakers. In any event, I thought it was an excellent way to portray Eden's influence and mentor-ship of Garland.